CULTURE OF REVOLUTION · Customer Obsession Observe in the zone OBSERVING THE CUSTOMER used to mean conducting focus groups, surveys, and interviews. There is still a place for this sort of re- search, but it will not help you connect. 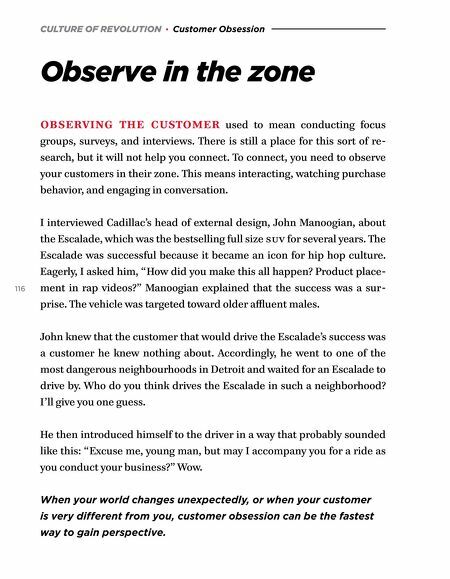 To connect, you need to observe your customers in their zone. This means interacting, watching purchase behavior, and engaging in conversation. 116 I interviewed Cadillac's head of external design, John Manoogian, about the Escalade, which was the bestselling full size suv for several years. 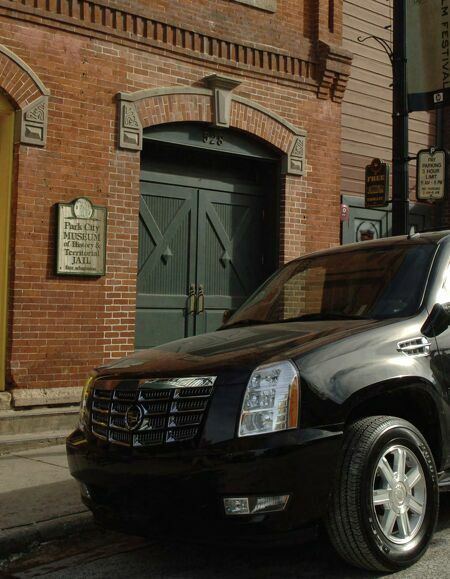 The Escalade was successful because it became an icon for hip hop culture. Eagerly, I asked him, "How did you make this all happen? Product place- ment in rap videos?" Manoogian explained that the success was a sur- prise. The vehicle was targeted toward older affluent males. John knew that the customer that would drive the Escalade's success was a customer he knew nothing about. Accordingly, he went to one of the most dangerous neighbourhoods in Detroit and waited for an Escalade to drive by. Who do you think drives the Escalade in such a neighborhood? I'll give you one guess. He then introduced himself to the driver in a way that probably sounded like this: "Excuse me, young man, but may I accompany you for a ride as you conduct your business?" Wow. When your world changes unexpectedly, or when your customer is very different from you, customer obsession can be the fastest way to gain perspective.